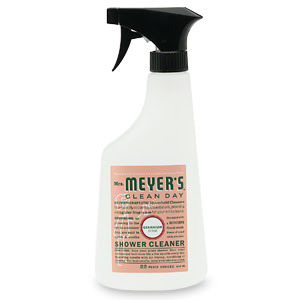 To rave about Mrs. Meyer's cleaning products. They're eco-friendly. They smell good. They make it bearable to, you know, clean. But I didn't appreciate the shower cleaner until today. You're supposed to squirt it on your tiles, shower curtain, etc, every day to prevent soap scum build-up. Which I must admit I do not do. But this morning -- in a complete panic because my mother-in-law was about to arrive and I had not replaced the mildew-ridden shower curtain liner -- I tried spraying it on the mildew. Boom. The black gunk rinsed right off with mere encouragement from a scrub brush. A far cry from the last time I labored to clean mildew off a shower curtain with traditional cleanser. You have your choice of basil, lavender, lemon verbena or geranium (scented with essential oils). I favor the lavender, especially since I read on Earth Friendly Weddings that lavender helps you sleep. Maybe I should start cleaning before bed? Their geranium fabric softener is my favorite. wow fabric softener? I wouldn't even know how to use that. I saw these at Central Market the other day & was planning on buying some when our current cleaning supplies run out! I love the packaging, too.